Directly from Italy, we love this collection of monochromatic designs... jewelry, seasonal, and lovely hearts from Livia and Paola Rovaris. 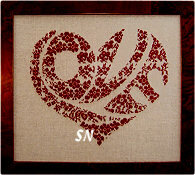 All presented in chart format, although everything is stitched in red -- you KNOW you can change any colors you wish!!! 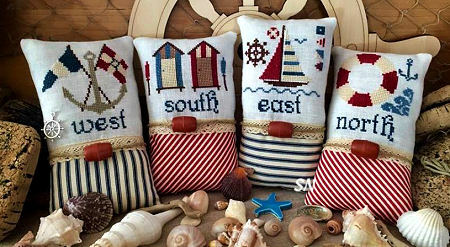 Charming Seaside-Themed Designs - I love them all! Direct from the Italian Coastline, these are all presented in chart format and are coded for DMC floss. 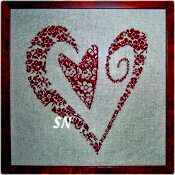 Each one comes with a special embellishment, and most have a cut of lace or ribbon as well. We have a few other charts we picked up... click through to their page to see the rest! 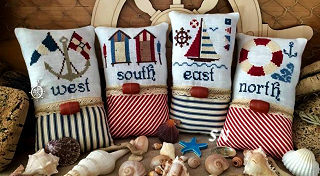 North, South, East & West - All 4 designs are in this chart pack, along with a ship's wheel charm and the lace you see in the finishing treatment. You'll need to find some cute striped fabrics, which should be pretty easy. 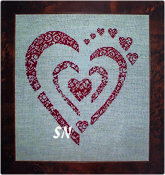 Each design measures 53 x 53 in stitch count, so on 32ct, they are about 3-1/2 inches in size. Whale - Measures 147 x 46, you get the sailboat and whale tail charms! 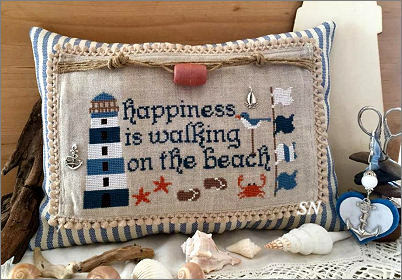 Anchor Beach - Measures 96 x 61, you get the anchor charm and white lace to trim both end of the design. 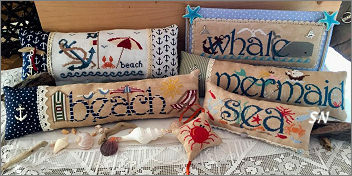 Beach (The Word) - Measures 170 x 51, This one comes with a mermaid charm that is over an inch in size, and that dividing lace. Sea - Measures 123 x 37, you get the crab chart as well. The crab charm is super-cute, comes with the crab-orange ribbon shown in the pic. Mermaid - Measures 165 x 57 (about 10 x 3 on 32ct). A different mermaid charm in this one - her very curly tail is hard to see in the pic, but it's super-cute! Lace too. America - Measuring 203 x 52 - about 12-1/2 x 3 on 32ct... 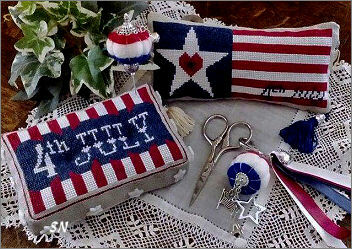 This chart comes with the little wooden painted flag button (hard to see near the top), a star charm and lace trimming. 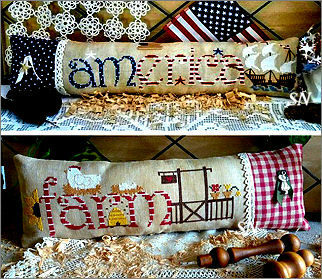 Farm - Measuring 160 x 59, this one is cute with only the word as a shortened option! Sunbonnet Sue is the featured charm, as well as more lace trim. 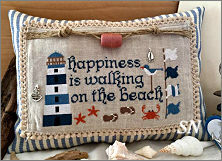 This one measures 122 x 67, and comes with a sailboat and nautilus shell charm. The rope treatment shown in the finishing is really cool, too. I love that little July 4th pin mattress! Two charts in here, one makes the 75 x 50 mattress, the other the 100 x 45 pin cushion, using DMCs of white, 815 and 813. These would be pretty worked in hand-dyed flosses instead, but stick with the natural colored linen so the white color shows up against the material. Presented as the chart, it comes with 14 white star buttons. We have a few of those cute little felt heart scissor fobs as well! What a stunning pair of designs by Rovaris of Italy! 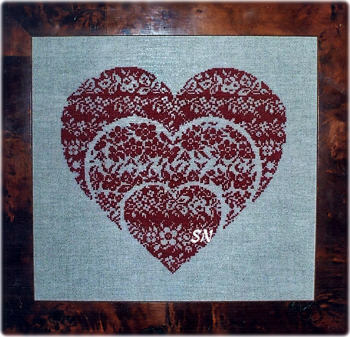 A new trio of hearts -- each of these is presented in chart format -- and offer simple elegance! All are stitched in DMC 815 red... but you could choose any solid or hand-dyed cotton or silk you wish. On 32ct, they finish approx 9 x 9, give or take a few stitches. 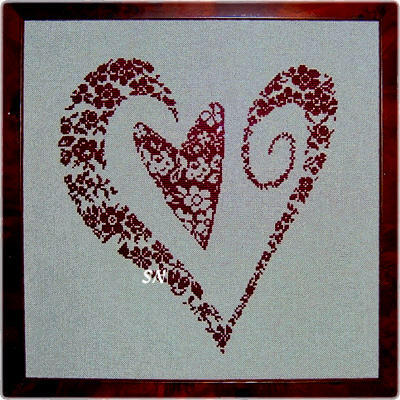 One of the shop gals does these over one (a little over 4 x 4 on 40ct)... and they would be lovely as needlework mounted next to a wedding invitation in a double-opening presentation. Or... just the way they are! What a stunning pair of designs by Rovaris of Italy! 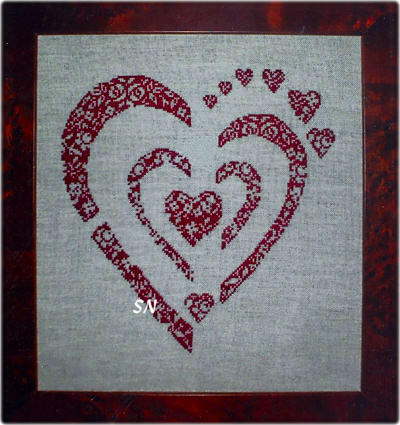 Offered in chart format, each heart is simply Cross Stitch in #815 DMC floss. 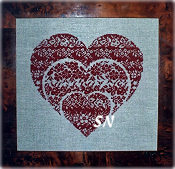 Stitch counts are almost identical -- the stacked trio design is 155 x 144. They don't have names, and I am sure you could work them on most any count -- and choose most any pretty hand-dyed thread you wish. I just think they are sophisticated and very unique for our marketplace, so I delighted in buying them!! !